PIE ... You, Too, Can Undo the Curse of the Jack-o'-Lantern! Okay, folks, ‘fess up. 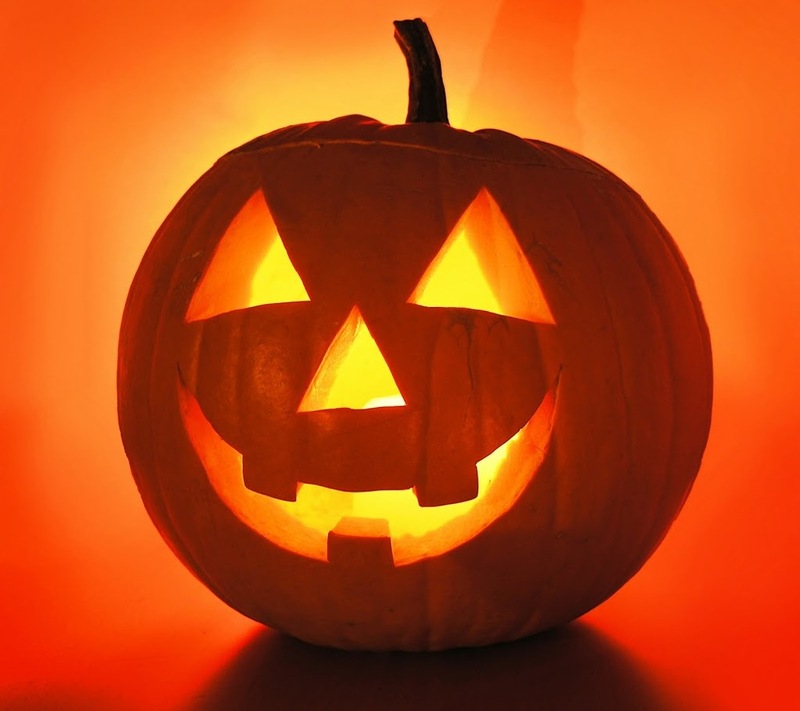 You’ve got a pumpkin with an expiration date that’s today – Halloween! In case you haven’t noticed, tomorrow is post Halloween. 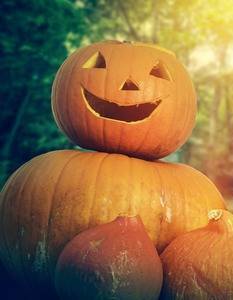 Your front porch or windowsill likely will still boast the evidence, but you’re going to have to do something soon about the Big Round Orange Guy, whether he’s intact or been carved into a glorious jack-o’-lantern. Of course, you could dump Jack in the trash. 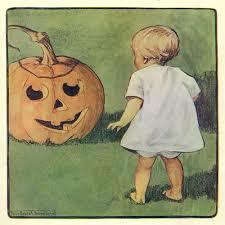 But jack-o’-lanterns make garbage cans awful heavy. When I first moved to Maine, I learned that lesson the hard way. Oh, my aching back. On the other hand, John (my husband, not “Jack”) and I are fortunate to live in a forest inhabited by deer, foxes, turkeys, bears, coyotes, and squirrels. The first October here, I figured surely someone in the Animal Kingdom other than homo sapiens would want our carefully sculptured orange jewel. Yum. Tasty treat. Cradling Jack, I hiked off through the trees to the edge of a clearing, far enough away from the house to discourage the idea that there’d be more goodies from us. I set Jack on a pile of oak leaves where he looked mighty handsome, even jaunty. Definitely a culinary temptation. With an affectionate “good-bye” and a “best-of-luck,” I walked away. Jack stayed on my mind. After a couple of days, I hiked back in, expecting to find he’d been so popular that nothing remained. But no, there he was, still on his bed of leaves. Sadly, his grin was deflating. He was rotting. I left and tried to forget Jack. The last of the autumn leaves fell. The temperatures plunged. A light snow dusted the trees and grasses. Our wildlife needed food, I told myself. They must be hungry. And so I returned, but Jack was still there. He was as flat and brown as a pumpkin pancake. I didn’t see a single nibble mark. I got the message: No one wanted him. And then it struck me ... I hadn’t wanted him either. How is it that something so enticing one day can become unwanted the next? I considered the meaning of loyalty. I poked Jack with the toe of my boot. Hard as granite. He’d frozen from neglect and rejection. Just like some people I know. Maybe I was feeling my own sense of past isolation. What about the high school boyfriend who went away to college and never wrote me? Or my first husband who thought he’d married a housewife but got stuck with a writer instead — now there’s a horror story. And then there were the rejections of editors when I'd first started out. I could've papered a bathroom with them. Worse, what about the times editors tried to rewrite me? Talk about rejection! Self-pity rose in my throat. I kicked Jack – after all, he was just an orange rock now – and stomped away. 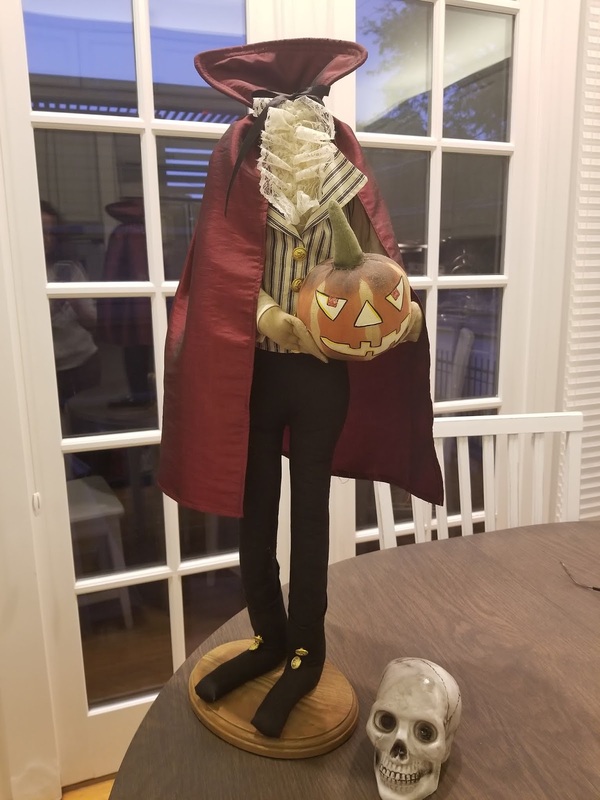 The next October, we bought a magnificent pumpkin and carved it. 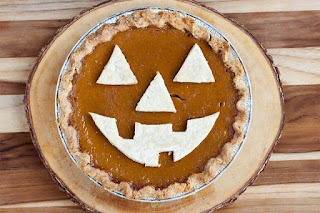 After Halloween, I used my mother’s recipes to cut it up and make a remarkably delicious pumpkin pie. Mom never rejected me. One of the secrets of great pie crusts is to understand the chemistry of your shortening – keeping everything cold (brrr) until you slide the crust into the oven encourages it to bake into a flaky, mouth-watering pastry. So put your mixing bowl, utensils, and ingredients in the refrigerator (or ice box, as my family used to say) until they’re truly chilled. Then cut your shortening into the flour and salt until the mix is crumbly, about the size of peas. Add in – as little as possible – cold water. Pat the mixture into a ball and put it back in the refrigerator until all is chilled again. Sprinkle cold flour on your table top and roll your pie crust thin as you can. Drape the crust into a pie tin. Make the edges pretty. Now you can refrigerate until you’re ready to bake your pie. Gird yourself ... you've got to gut Jack. He won’t mind – he’s going to turn into a beautiful, aromatic pumpkin pie your family and friends will discover is far tastier than the stuff you get out of can. For great instructions on how to take possession of Jack's innards, click on this link: Pick Your Own. Or, if you’re like me these days, you’re going to fling aside any potential guilt and buy a can of pumpkin to use as your base. It’ll be delicious, too! Bake your pie crust for 10 to15 minutes at 400 degrees to minimize it from getting soggy. While it's baking, gently stir all of the pumpkin ingredients together. After you remove the crust from the oven, pour the pumpkin mix into the crust. Bake the pie 10 minutes at 450 degrees. Reduce heat to 300 degrees and bake 45 to 50 minutes until the crust is brown and the pumpkin mix is starting to set. Serve warm with a scoop of vanilla bean ice cream. Welcome to Pumpkin Pie Heaven! What are your favorite holiday pies? Is pumpkin among them? Touched is the word that comes to mind. Which of course can be taken two ways. This Halloween, as the Rogues reveal their scary encounters (or attempted encounters) with those from beyond, the word so aptly describes my experiences. It's well known in my family that I'm the crazy one. For years I've seen spirits. Shadows that swirl around and seem to multiply just before someone I love passes. And, more than once, I've seen actual people. The first ghost I ever saw was a rattlesnake ghost. I was six. My father was sitting beside my bed reading to me from Pinocchio when I the snake stuck its head up at the side of the bunk near my feet. I shrank back toward the head of the bed and told Dad to be careful. He turned off the light and told me to go to sleep. Right! The second spirit was one I conjured. I grew up in an triad A-frame house that my father built. It had two lofts—one that was my play loft and one with two bunks where I hosted sleepovers with my friends. You could only get up into them by ladder. An only child, I thought it would be fun to have a playmate, so I made up the ghost of "the girl in the loft." The weird thing was, when I no longer wanted her there, she refused to leave. Eventually I left for college and my folks sold the house. The first full blown spirit I saw was a young man standing near the stereo in my home in Frisco, CO. He was short, with dark hair and dressed in shamrock green. It was March. A leprechaun? No one else could see him, and he disappeared when the phone rang. The caller was my mother telling me a close childhood friend of mine had died from a drug overdose. I was nine months pregnant. They chalked my vision up to hormones. We've all heard that it's not uncommon for dying people to "see" family members who have already passed, but I admit to being surprised when I received a frantic phone call from my grandmother's nursing home. They wanted me to come right away. My grandmother was "talking in tongues." Not exactly. It turned out she was speaking Swedish As I walked in the room, she brightened, more animated than I'd seen her in months. "Christy," she said. "I'm so glad you're here. You've never met your great-grandmother, have you?" For the next hour, Gram proceeded to switch between English and Swedish, introducing me to her mother, Emma Christina, and translating our conversation. Clearly she believed my great-grandmother was in the room. 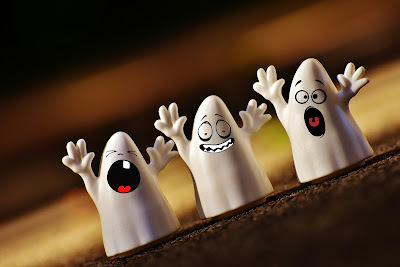 What frightened me was, I was seeing spirits at home. It wasn't the first time I'd seen "shadow people." I first saw them when my mother was dying from cancer. Swirling figures who would gather in my house, and follow me room to room. I saw them when my father-in-law died, when my mother-in-law fell ill, when I lost my dear friend Janet. The take away—I see ghosts when someone close to me is about to pass. A week after being introduced to my great-grandmother, I became aware of the gathering spirits and bolted up the stairs toward my bedroom. For the first time, I could actually pull faces out of the crowd. Taking the stairs two at a time, I bumped into someone halfway up. We hit shoulders hard, and I shouted, "Get away." My husband called down from the bedroom, "They're only trying to comfort you." With Wes snoring, I convinced myself it was all in my head and crawled under the covers without waking him up. Then a couple of hours later, I sat straight up in bed. My heart pounded. My breath shallow. Wes—who still appeared to be sleeping—said, "Lie back down. They won't call for an hour." I lay there awake until the phone rang at 1:30 a.m. My grandmother had died at 12:30. I hate seeing spirits. They scare me. Though, sometimes I'll see them now and nothing bad happens. Once in our Denver house, I saw a young girl standing near the fireplace. We lived in an historical residence, but I have no idea why she was there. She looked to be about seven, dark-haired, wearing a pink wool coat and hat with black velvet piping and black patent leather shoes. She just stood and stared, her eyes wide, as though she was just as surprised to see me. I was sick, recovering from surgery. Everyone around me blamed it on drugs. Still, I must admit, I am that person. The one who can't handle scary movies; who sleeps with the bathroom light on if I'm home alone. After seeing "The Haunting," a 1963 film based on "The Haunting of Hill House" by Shirley Jackson, I can no longer sleep with an arm or leg draped over the side of the bed. I still sometimes feel ghost animals walking across the duvet. And, just the other night, when my husband was out-of-town, I felt someone sit down on the edge of the bed. It was 2:35 a.m. The light was on. I was terrified. Were I braver, maybe I'd try and engage with those that gather. I've never sensed malevolence. They're likely family and friends, and I would love the chance to talk with my mother again. 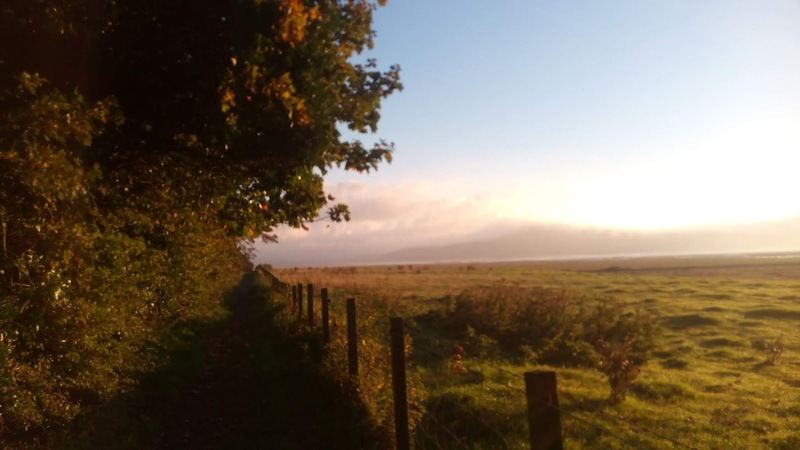 In a comment to Robin Burcell's blog, "There's a Ghost in my Bedroom" (Oct 2018), Gayle Lynds wrote about how her daughter kept finding pennies in unexpected places after her grandmother died. I LOVE the idea of finding pennies. The closest I've come is an earring. I was in my new office, sitting in a new chair, when I heard something drop to the wood floor. Looking down I found a small, gold hoop earring. It was one of a pair that my grandmother had brought home from Sweden and given me when I was sixteen years old. They were my favorite, and I had lost it six month earlier. Fortunately, I'd never thrown away the mate. I still wear those earrings, everyday. I am convinced, if we're honest with ourselves, that everyone has experienced something that cannot be explained, something that defies reason. A roommate I had after college told me about her mother, who had lost a little sister in a fiery car crash years ago, when they were still in high school. Fast forward ten years and Shelley was born, and her mother heard her sister's voice telling her to "come into the other room. I'm there." Her mother did as asked, but only Shelley was there, lying in her cradle. Her mother never said a word, not until Shelley was a young adult and seeing a therapist to help her with her pyrophobia. Rogue Readers, I'd love to hear some of your stories of the unexplained. Care to share? I promise, I won't call you crazy. 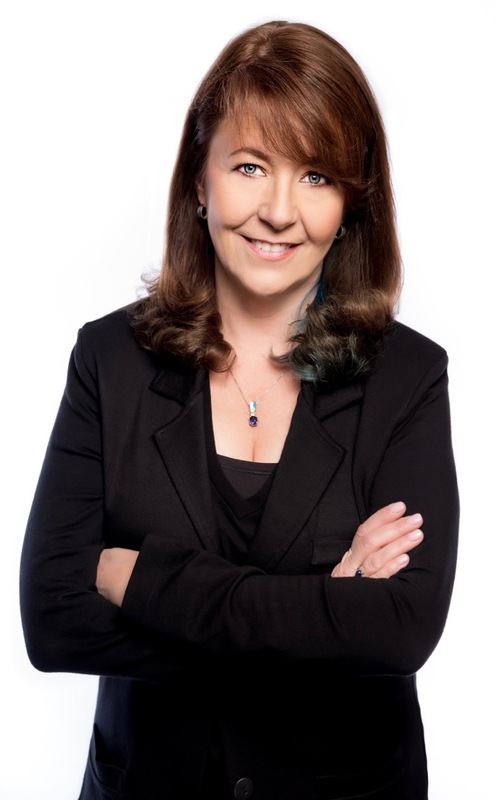 We're lucky to have Julie Hyzy, the NYTimes Bestselling author of a string of mysteries talking to us about her writing process, a close encounter with Ray Bradbury, and the challenges of parallel parking an old Ford LTD sedan as a teenager. Read on! Rogues: Which is harder to write -- your novel's first sentence, or the last? First sentences, by far. Every novel starts the same way: with my jazzed brain dancing with new-project excitement. It’s as though I have a million shiny jigsaw puzzle pieces bouncing around in front of me. All of them are SO important, so attractive, so exhilarating. But then I take a deep breath and realize that if I attack them all at once, I’ll wind up with nothing but a jumbled mess. Choosing the perfect point to work from in order to build the whole picture in a satisfying way is the hardest part for me. I agonize forever. Then I type, erase, repeat. By contrast, last sentences almost always deliver themselves—though that’s not to say I haven’t struggled over a few of them as well. I tend to play around with a final scene for a bit and at some point, the right words emerge to form language that I’m particularly satisfied with. Boom! Done! Go back and revise the first line again, of course. Rogues: What's your favorite word? If by favorite, you mean the word I accidentally use most often, it’s probably “just.” At the completion of every novel, I do a word search and invariably have to change buckets of them. For favorites I use on purpose, it’s probably “launched.” Fun, active verb. I do adore the word “luminous” although I don’t use it often. Rogues: Where do you like to write? At home in my cave. At least that’s what the family calls it. In here, I have everything I need: Desktop computer, comfy chair, books, window, calendar. If I need chocolate or coffee, I’m not far from the kitchen. Rogues: What do you do when you need to take a break from writing? My two favorite things: I read or I eat. Sometimes both at once. I have several TBR piles, all of which contain more books than I’d be able to get through in a year, even though I usually have multiple titles going at once. I know that many people prefer to read one book at a time. I have at least one book going per pile and, when I sit down to relax (or have lunch), I reach for whichever one is closest. Eating is one of my absolute pleasures. Whether we’re dining out, or gathering around a table with friends, or I’m spending a Sunday afternoon in the kitchen, food-related activities take up a whole lot of my mental and physical energy. I enjoy trying new combinations and I absolutely love researching new restaurants. How else do you think I achieved my VIP status on OpenTable? Rogues: If you could have lived in a different time period, what would it be? I would want to be born fifty or even a hundred years from now. I have high hopes for the continued evolution of humankind (which probably explains my Star Trek obsession) and I’m optimistic about the future. And consider the technology! 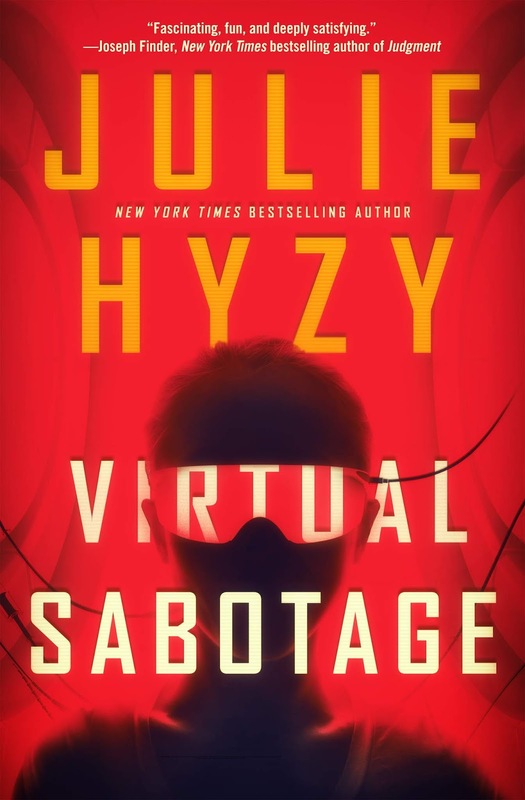 In Virtual Sabotage, I offer a view of where current technology may take us. But there are so many possibilities, I can’t even imagine what we’ll have at our disposal by the end of this century. I’d sure like to see and experience it all. Rogues: What's your favorite drink? Non-alcoholic: Water. Lots of it. Alcoholic: It’s a tossup. Either a raspberry lemon drop martini (no sugar on the rim, please) or a full-bodied red. Right now I’m partial to tempranillo. Rogues: When you were ten years old, what did you want to be when you grew up? I’ve always wanted to be a writer. For a short time, I thought acting would be fun, but writing has always been my passion. At age 10, I was producing a neighborhood newspaper that I sold for five cents a copy, netting me fifty cents per week. (We had kind neighbors.) By then, I’d also started my first mystery series. My eighth grade English teacher wrote a note in my autograph book (remember those?) telling me that she expected to see a published novel out of me some day. That meant a lot to me then, and it still does. The coolest part? She and I have reconnected to become grown-up friends! Rogues: Do you have a literary hero? A teacher, mentor, family member, author? Ray Bradbury is my author hero, no two ways about that. Someday, if you haven’t already heard the story, let me tell you about my interaction with Ray Bradbury (Rogues: Check out the letter she received!). The world is a better place because of that awesome man. Rogues: Describe your very first car. How about the car I learned to drive on? My parents had a light brown Ford LTD with a black vinyl roof that we named Frances. No idea what year it was because we bought her used at Crazy Frank’s on Western Avenue in Chicago. Frances was huge by today’s standards. I learned how to parallel park driving her which means I can parallel park just about anything. Rogues: Do you write what you know or what you want to know? While I much prefer to write what I want to know, the truth is that much of what I do know gets sprinkled in there whether I intend it to or not. I love researching and, if I’m not careful, I can lose whole days chasing one interesting detail after another. Research is that addictive. There are so many fascinating tidbits to uncover. The trouble comes later, after the book is published and I’ve forgotten a good deal of what I learned along the way. Apparently, old information needs to make room for new stuff moving in—juicy stuff that I’m eager to share. If I could remember even half of what I learned along the way as I’ve written my twenty-plus novels, I’d be a shoo-in on Jeopardy! One of my Halloween pumpkins. Quickly, though, let me catch up those who are not familiar with Pushing Daisies. It was a wonderful TV series about a pie-maker, who discovered that when he touched someone who was dead, he could bring them to life for a few seconds, whereby they’d utter something, usually a vague clue about how they died, and it was up to the pie-maker to solve the murder. Billed as a comedy, drama and fantasy, it didn’t take itself too seriously, obviously, but it was a delightful show during its two-year run (2007-2009). Anyway, sometime after that show ran, my father was ill and in a convalescent home. We were not particularly close (I was raised by my grandparents after he and my mother divorced), and I felt a mix of emotions when I and my siblings went to visit him that last occasion. He was no longer eating or drinking and we were told at that point it was just a matter of time. Therefore, it was no surprise when, a few days later, my stepmother called early one morning to tell me he had died. It was still dark out and the sun wouldn’t rise for another three hours, but I was wide awake, thinking about my father. I recall my husband and I exchanging a few brief words about whether or not I should call my siblings—he said to wait until later—and eventually I fell back asleep. 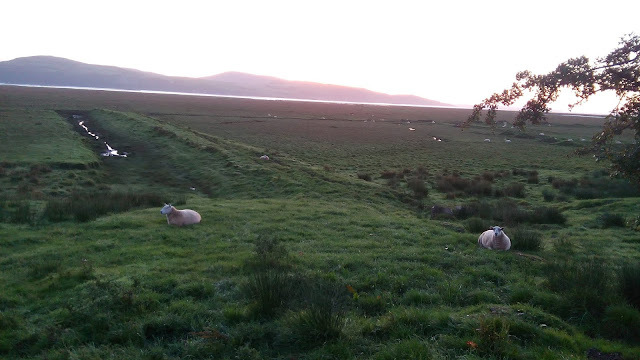 I awoke twice that cold January morning before sunup. The first time was not too long after the call. I dreamed that my father was standing at my bedside, and he reached over and touched my ribcage. I felt that touch. It startled me awake. As I lay there, thinking how vivid that dream seemed, I wondered if it came about because of the phone call, probably mixing with memories of the TV show Pushing Daisies. Suddenly, my dog barked, jumped up from her corner, leaped onto our bed, ran across it, jumped off, raced around the room, then finally settled down. Mind you, my dog going crazy was within seconds of my waking up from the dream—and she had never done anything like this before. Ever. Okay, creepy, but easy to justify, right? When I startled awake, it simply caught my dog by surprise. Simple. We must have woken each other. I waited for my heartbeat to slow and I fell asleep again. A couple of hours later, I hear my cell phone ringing in the living room. I have no idea who would call my cell phone at that hour, but I trudge out there to answer it. It’s my mother, calling out of the blue, at 5:30 AM. (If you knew my mother, you would know that this is not normal.) She figured I’d be on my way to work, sorry to wake me. I tell her my father died, so I am not going to work. She tells me she’s sorry to hear it. We have a brief discussion, probably about funerals, notifying siblings, that sort of thing, but it was a few minutes long, and I go back to bed. My husband is awake this time, I assume from hearing the phone ring, so I tell him about my dream and how the dog went ape right after. I explain how vivid it all seemed. He tells me "not to push this woo-woo thing further" but our youngest daughter just woke him. She brought a music box into our bedroom, because it started playing by itself. He told her to put it on the dresser and go back to bed. I look over at the music box, which is one of four the twins have on a shelf several feet above their little beds. Each is a different bird, and each plays a different song. Sparrow, cardinal, bluebird and robin. Is it a coincidence that my namesake, the robin, was playing “Somewhere over the Rainbow” on its own? My daughter would’ve had to stand on the bed to get it down to bring to our room. What caused it to play on its own? “I do believe in spooks. I do, I do, I do…” (Bonus points if you can guess where that quote came from!) Some time after, I told this story to a few friends, only to discover that they've experienced similar ghostly phenomena after the death of someone close. It’s just not a thing they talked about—perhaps, because, unlike Lewis Carroll’s Tea Party, where all the best people are "bonkers," not everyone wants to admit they might have had a close encounter. But since I know I'm bonkers (just ask my kids), I'm not afraid to admit anything! How about you, Rogue Readers? Do you believe in ghosts? I’d love to hear your stories. W.S. Bodey got bored in Poughkeepsie, NY, and went west to join the gold rush. 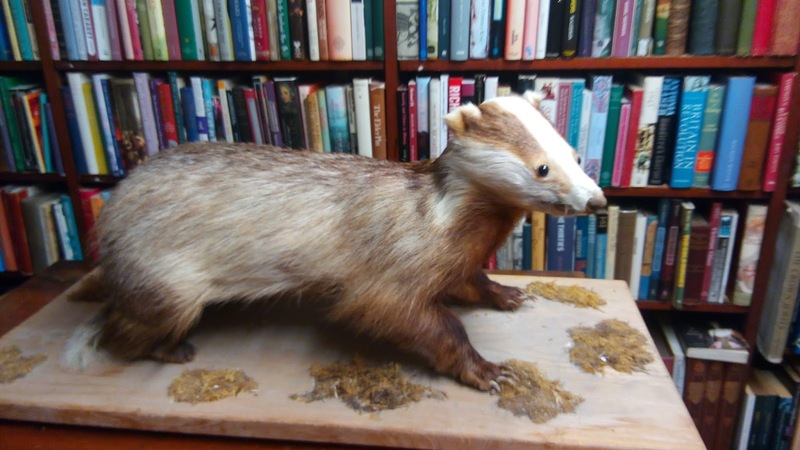 There is no note of how Mrs. Bodey, left behind with their two children, felt about this, but in any event it took him less than a year to find gold in them thar hills of California (near the Nevada border). Unfortunately neither of the Bodeys ever got to reap these rewards; Mr. Bodey died in a blizzard while on a supply trip to another town. His body was not discovered until the following spring. He would make an appropriately dissatisfied ghost for the place, but so far has declined to haunt. 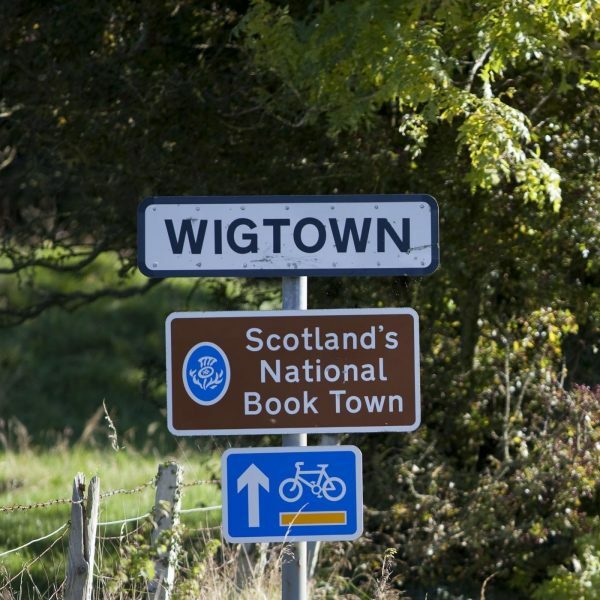 Perhaps naming the town after him placated, even though it had been largely accidental—and misspelled. A sign painter took the liberty of declaring a barn the “Bodie Stables” and the name stuck. So did the gold, not as an overnight boom but a slow gaining of mills and mines and success. Twenty years later the town had between five and seven thousand residents—remarkable for an area remote from a port, a railroad, or another city. To reach it today still requires spending three miles on a dirt road (yay, rental car!). The wind is pervasive and now I understand all the references to dust in old westerns. But in another twenty, the gold began to peter out and so did the population. Five years after that, in 1915, came the official label of ‘ghost town’ though families still lived there as late as 1942. Another twenty years and it became a state park, where rangers preserve it in a state of ‘arrested decay.’ Everything is kept as it was found in 1962, no better, no worse. As I peered through windows or entered the few homes that had open areas I saw peeling wallpaper, rusted pipes and abandoned toys. Was it creepy? In the middle of a vacation day, with a bright warming sun, surrounded by families on an educational outing, not at all. Go back at night and it would be something straight out of The Blair Witch Project…but that’s why parks close at sunset. Yes, but are there ghosts? 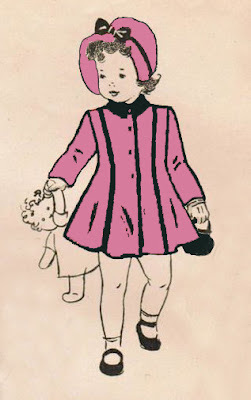 Stories of small children giggling with invisible playmates in the cemetery might be due to Evelyn, a three-year-old accidentally killed by a pickaxe in 1897. Evelyn liked to tag after the miners and watch them work. One day a kindly miner told her to go home because the weather looked to turn rough, and waited until she went. However she crept back, and a swing of his axe ended her life. Then there’s the Cain house: the wealthiest man in town could afford servants, and supposedly he hired a pretty Chinese woman. A little too pretty for Mrs. Cain’s tastes—she had her husband fire the woman and the inevitable rumors that accompanied this action ruined the former maid’s chances for honest work. Faced with the choice of prostitution or starvation, she chose suicide. After the town became a park and the wealthy man’s house became rangers’ quarters, the maid makes her presence felt in the upstairs bedrooms. She amuses children but is not so benevolent to adults, opening and closing doors, turning lights on and off, laying a cold presence along their bodies while in bed. The 500 foot level of one of the mines is reportedly haunted by the ghost of a white mule, killed in an accident there. Miners refused to work on that level. 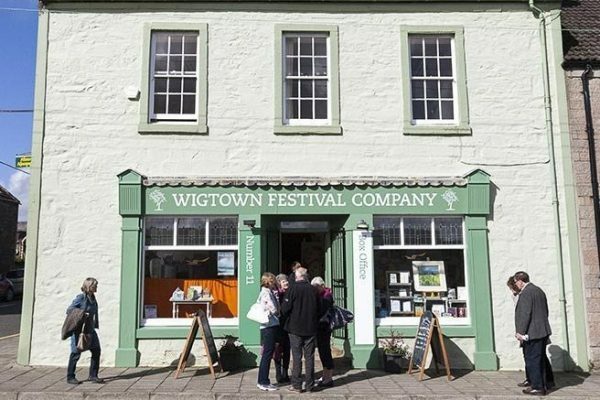 Surprisingly, the one known murder in the town has no ghostly activity attached to it. In 1881 Joseph DeRoche made the mistake of dancing with Thomas Treloar’s wife. It’s not certain if their relationship had been deeper than that but in any event DeRoche, not the man’s wife, felt himself aggrieved and waited outside for the married couple. He shot Treloar in the head, was instantly caught, turned over to an intoxicated deputy, and instantly escaped. He only put eight miles behind him when he was again caught and returned to Bodie to stand trial. He was convicted, but the sentence didn’t seem swift enough for close to two hundred armed men, who marched to the jail in the wee hours of the following morning. Somewhat courteously, they knocked on the door and waited while the deputy (not intoxicated, and therefore able to grasp the realities of his situation) produced the prisoner. The condemned man, though terrified, remained calm and quiet as the mob, fairly calm and quiet themselves, arranged a makeshift gallows. A hoist used by the blacksmith to fix wagons was relocated to the corner near the dance hall, and DeRoche was solemnly hung on the very spot where he had murdered Thomas Treloar. Their spirits have not been heard from, perhaps feeling that nothing more remains to be said. To me, what lay over the town is not a spooky apparition but a much more unsettling entity: the stark illustration of how things can change. Not just fashions and technology, but industries, livelihoods, gathering places. Change can be a pathway to greater things, of course--surely many families were happy to find themselves in more bustling areas, closer to family and friends and with more opportunities for their children. But change can also stem from broken dreams, dead ends and disappointments, with a restless ghost just one more of the things left behind. Have you encountered a ghost area, and what haunted it? 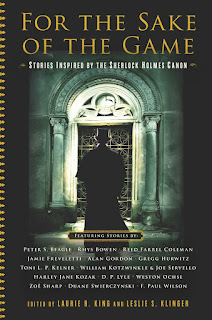 On Sale December 4th--a Sherlock Holmes inspired Anthology! Halloween is upon us. 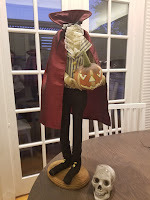 I know this because I'm stocking up on candy and Ichabod Crane and his skull friend (see photo below) are on display in the window of my house. We found Ichbod on a trip through the town of Sleepy Hollow a few years ago. I like Halloween and I also like the annual retelling of stories about haunted places in and around Chicago. In fact, I liked them so much that I added these highlights to my soon- to- be- published story featuring Sherlock Holmes. The Case Of The Ghost On The Lake. A little background; Leslie Klinger, an avid Sherlockian, and Laurie R. King, author of the Mary Russell series featuring Sherlock Holmes, have been editing anthologies featuring the character for a few years now. In fact, our own Gayle Lynds wrote for an earlier anthology, A Study in Sherlock. Last year they approached me to write a short story for the upcoming collection. The resulting anthology also includes stories by a whole host of great writers and launches on December 4th. Initially I was petrified. Sherlock Holmes is such an iconic character that I wasn't sure I was up to the task of bringing him to life. But as I thought about it, an idea started forming in my mind; what if he solved a case in present day Chicago? And what if the mystery involved some the most haunted and/or unique locations around the city? I also wanted to throw in some hidden facts that only a Sherlockian would know. As you can imagine, there are reams of Holmes fans around the world and I figured I could put in an "Easter Egg" or hidden hint, in the story. It's there, but I won't reveal it here. Just a fun thing that only Sherlockians would be able to pinpoint and embellish upon. There are plenty of "haunted" places here in Chicago. One of the most famous involves the old Congress Hotel, where Al Capone stayed and kept an office, among others. Room 441 in that hotel is said to be haunted by a translucent female ghost, eerie noises and moving furniture. This room supposedly garners the most calls to security in the hotel to this day. Then there is Resurrection Mary, believed to be the ghost of a young woman killed by a hit and run driver. As the legend goes, Mary started her haunting career in the 1930's when she began appearing near the old Resurrection Cemetery. Said to be dressed in a white, vintage-looking gown and wearing dancing shoes, she hitches a ride, asks to be let out near the Resurrection Cemetery, and promptly disappears. 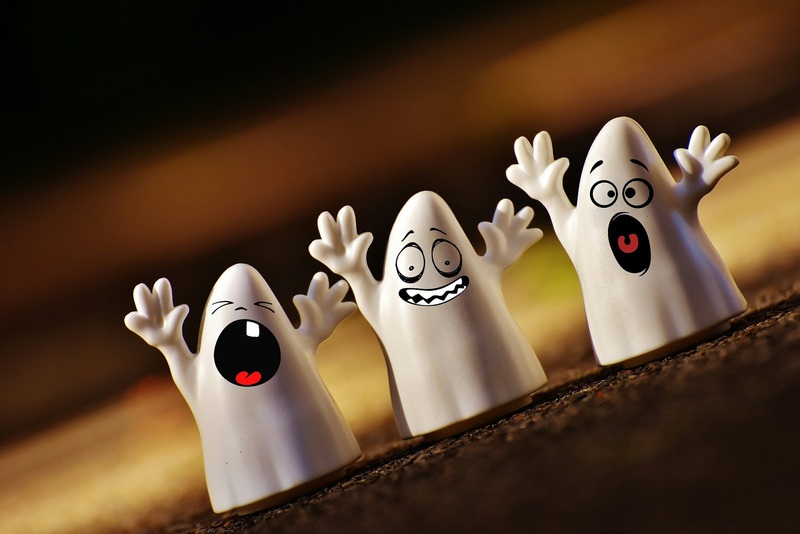 I'm not sure I believe in ghosts, but I have friends who swear they've seen one so perhaps I've never been in the right place at the right time. And honestly, that's just fine with me. Have you seen a ghost or experienced a strange phenomenon? Do tell in the comments below or on our Facebook page and Happy Halloween! We Rogues write thrillers and mysteries where we often see our novels described as tense, gripping, and explosive, with plots featuring spies, secrets and suspense. But do they -- or should they -- include a bit of humor (for "comic relief" perhaps)? 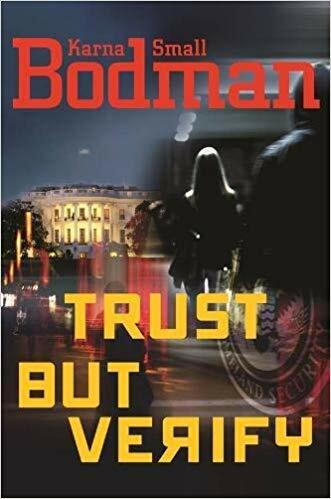 When I read the previous terrific post by our Rogue August Thomas where she described traveling in Scotland and having to allow time for sheep to cross the roads, it reminded me of a scene in my new thriller, Trust but Verify. Much of the action takes place in Jackson Hole where we had a summer home for many years and where I had the inspiration for the story. 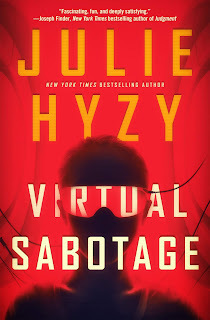 I wanted to write about a team of Russian oligarchs and mafia types who create a plot that targets a conference of international financial leaders -- a meeting that does take place every year there at the Jackson Lake Lodge. When I asked a hotel employee how long it would take to drive from town to the Lodge, I was told, "It all depends on the moose breaks." Huh? I soon learned that just as August experienced in Scotland, to do my research and scope out the area, I had to deal with traffic jams due to the many moose who decide to hang out on the roadways. Of course, I had to include that tidbit in the story. Then I decided to include other "features" of life in Jackson. In the story my heroine is scheduled to fly from The White House to Jackson (where she later becomes a target of those same Russians), and I couldn't resist creating a scene where her staff is briefing her on the upcoming trip. Her assistant says, "Besides the usual hiking and raft trips, they've got a bungee trampoline, a marching band at the Pink Garter Theatre, a hootenanny and a fair that includes pig wrestling and Arapahoe dancers." (All true). She goes on to say, "I think you have to watch out for the bears though. The Grand Teton National Park Foundation produced a video about how to tell the difference between a black bear and a grizzly." (Also true). "You're really supposed to stand there and analyze the difference?" her deputy asks. The assistant consults her notes. "Here's what you're supposed to do. 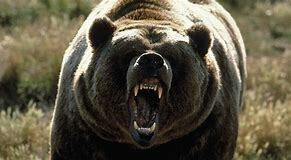 Take your bear spray, and if you've got a grizzly in front of you, spray it for six seconds." The deputy responds, "Wouldn't it be better to use those six seconds to run away?" At this point my heroine shakes her head and says, "Are you two finished?" 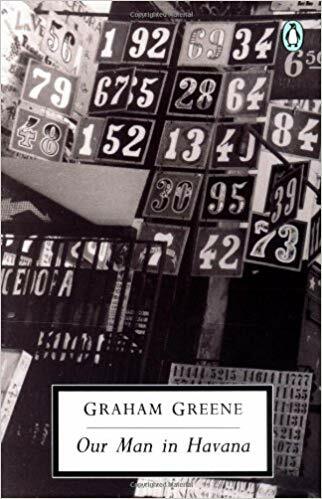 back in the 90's by Graham Greene, Our Man in Havana? It features Mr. Wormold, a vacuum cleaner salesman who becomes a spy to earn extra income. One reviewer wrote, "This crisply written novel will drag you down with unbearable tension, while at the same time make you giggle with its satirical parodies and absurd plot. A masterpiece!" 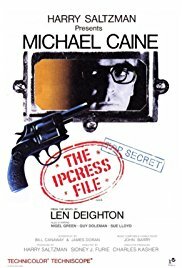 Another one that was also written decades ago was Len Deighton's The Ipcress File. In fact this great Cold War spy thriller is said to have "set the standards for the genre. Highly unusual, with a shrewd sense of humor." The classic novel has a protagonist who, at first, is a nameless spy, but later is dubbed Harry Palmer when made into a feature film starring the talented actor, Michael Caine. Here's another example of a mystery where the author, Ed McBain, (who was a script writer for Hitchcock's The Birds) creates not only great tension but such a humorous plot, it's easy to see how this particular writer is often called "the inventor of the genre." 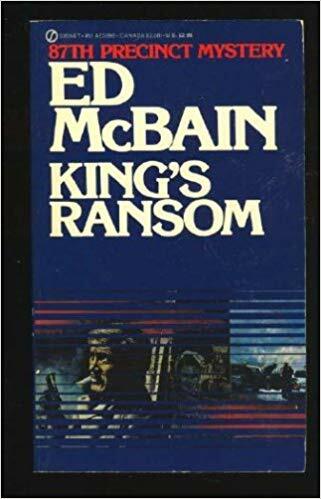 The novel is King's Ransom. The story is about ruthless thugs who try to kidnap the son of a rich tycoon (shades of our own Rogue, K.J. Howe's quite serious thrillers about kidnapping), but these 'bad guys" mistakenly take the son of his chauffeur. You could call this one a wise-cracking police procedural. Bond operation. Her job is to go after crooks who jump bail. She works with detectives and members of the local police force -- men with jobs that are often featured in mysteries and thrillers. Yet, Janet also creates characters that make you laugh out loud midst the chase scenes...characters like Stephanie's Grandma Mazur who goes to funerals of people she doesn't even know because she likes the cookies, or an uncle who talks to door knobs. 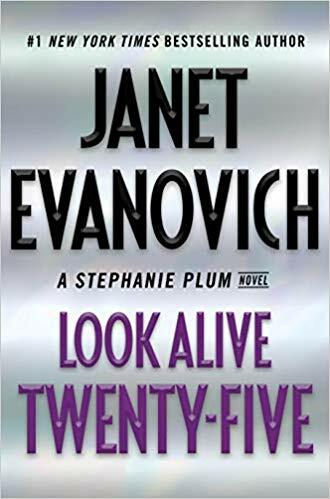 Now, the 25th book in the Plum series, Look Alive Twenty-five, will be out in just a few weeks, and I can't wait to take a break from tension and indulge in what I know will be a very funny tale. Now a question: do you want your thrillers to stick to suspense, spies and secrets, or do you like authors to lighten it up occasion? If it's the latter, what books have you read that interject humor into a traditional thriller format? Leave a comment below, or on our Facebook page (the icon is at the upper left of this Rogue page). And thanks for visiting us here at Rogue Women Writers.